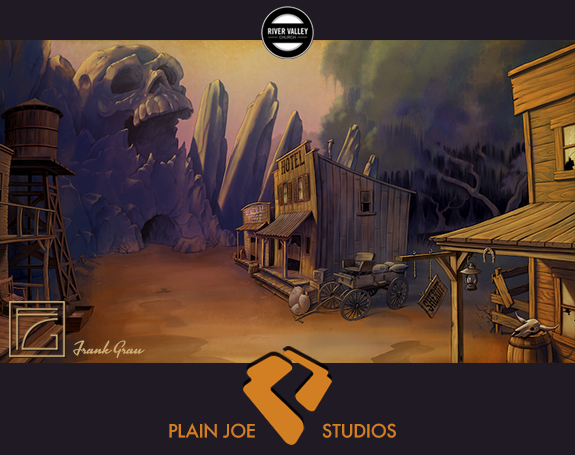 Here’s the final installment of background illustrations done for Plain Joe Studios‘ client, for their Go Kids cast of characters. 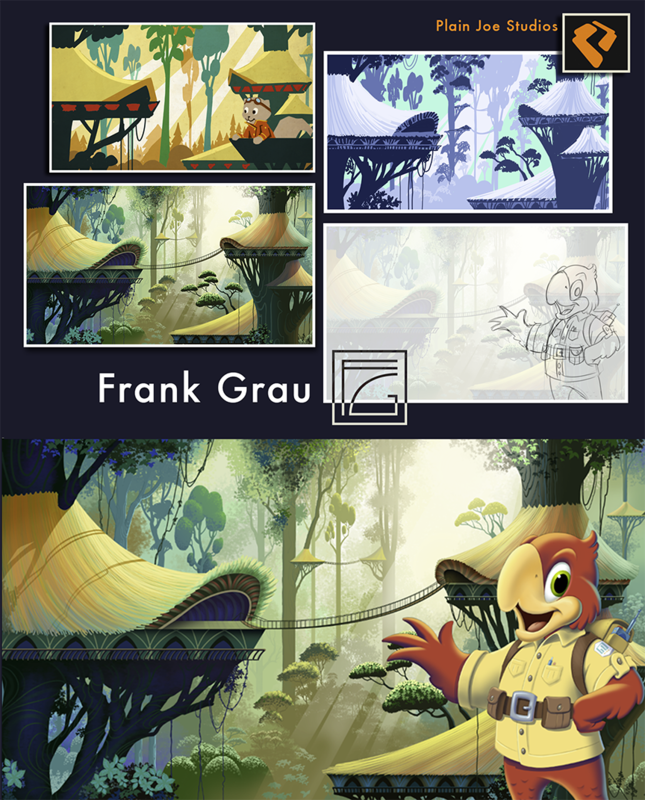 I prefer illustrating organic backgrounds to artificial structures because, well, because I’m lazy and it’s easier to draw a jungle than to draw a giant city in perfect perspective. Actually, creating organic forms is just so much more fun, what with all the wild foliage, vines, and such. Plus I like drawing gnarly tree limbs, twisting trunks, and tangled roots. If I had my druthers (I keep using that word without really knowing what a “druther” is), I’d be illustrating little fantasy stories that take place in all sorts of forests and wacky worlds. Honestly, I love creating charming artwork for children. My preference for the innocence of children’s media is probably why I prefer the fantasy wonderland of Disneyland to a “fast-ride” theme-park like Magic Mountain. 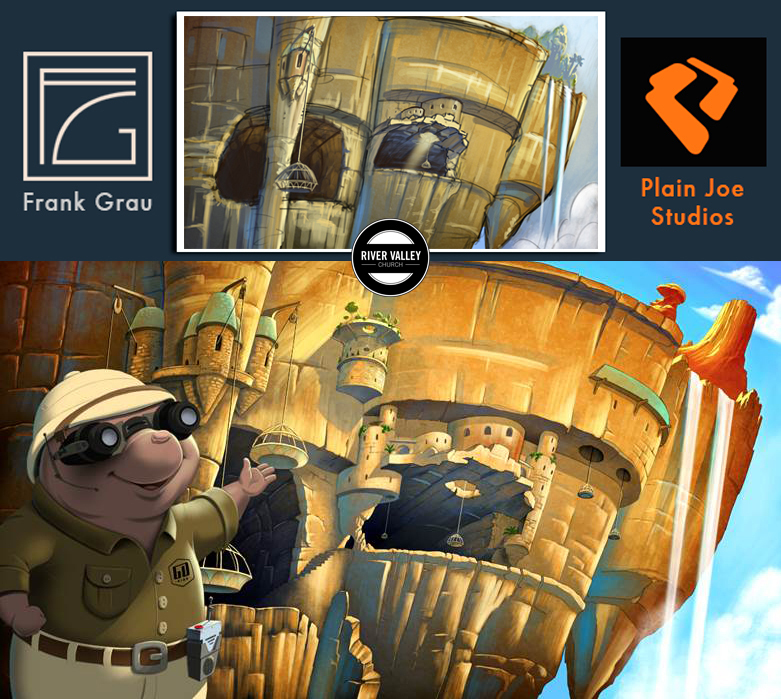 This lava city is another Go Kids “worlds” illustration done for Plain Joe Studios‘ client, River Valley Church. The smaller inset rough shows just how far I go on the roughs to convey the concept to the client before doing a final rendering. I probably could get away with doing a far more crude rough, but I’m always afraid that if I don’t convey enough information in the rough, the client may think the final art strayed too far from what they imagined. I’ll post one final Go Kids “worlds” illustration next week, at which time we’ll move back above ground. The creativity never stops at Plain Joe Studios. If I could post everything we did, I’d be posting every day, but then I’d never get anything else done. In any case, I only have a couple more of these I want to post in upcoming weeks and then I think I’ll start posting more Procreate “doodle” videos. This week’s Go Kids background follows last week’s illustration, which was the exterior of the underground part of the Go Kids’ “world”. Each of the larger world areas are themselves made of of a few smaller cities or districts. This is one of three underground locations. The smaller inset image in this case is not a rough of the larger image but is a previous variant done in a simplified, flat, graphic style that we initially tried. While I like the look of a flat, graphic style, I don’t go to that style naturally when I decide to do something for myself. Which style do you prefer? Here’s yet another sampling of an illustration done at Plain Joe Studios as a supplement to the spacial story characters created for River Valley Church’s Go Kids ministry. The smaller versions show the different ideas before arriving at the final rendering.